I woke up this morning feeling revitalised. My pain has subsided a great deal (but still there) and I felt happier. I no longer have the uncomfortable, squelchy wet dressings on, and this allowed me to get a full night's sleep, even in a squeaky single rubbery bed. I put this revitalisation down to a virtual hug. The Internet kept me company. I wrote my frustrations out, and you hugged me. I had people to talk to, and they empathised, made me laugh and made me feel loved. I couldn't keep up with so much social media! I received offers of greasy burger deliveries via email, text messages, Facebook chats and blog comments. 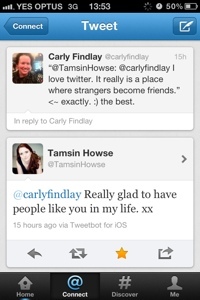 I had lots of lovely tweets - from bloggers, Tweeps across the country, real life friends, and celebrities I admire. Excuse me while I name drop (and see photos below). 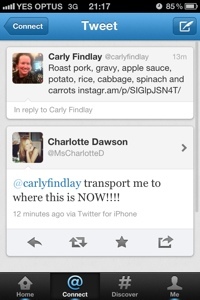 Charlotte Dawson envied my hospital food (a rare compliment to the hospital kitchen - which I've passed on via twitter!). 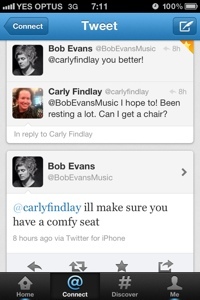 Bob Evans said I'd better be well enough for his show on Friday and that he'll save me a comfy seat there. 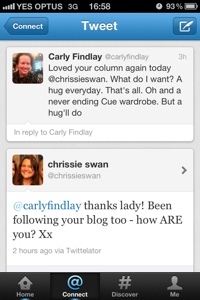 And Chrissie Swan asked me how I am and said she has been following my blog! READS MY BLOG! I read her column every week, and listen to her radio show. I feel very loved and truly thank everyone who's taken the time to check in how I am. The Internet can be littered with mean spirited people. It can bring us down sometimes, especially by people projecting their own unhappiness and insecurities onto us. Like a comment I received here yesterday (thank you for all the support I got after *that* comment). But gosh it can lift us up. I am so grateful for the friends I have made online, and for the internet bringing my real life friends closer. And I am so grateful that I have an outlet for the days that I can't get outside and interact with people in real life. Blogging truly is therapy. I shall report this back to my doctor tomorrow. This is awesome! Social Media for good and support! So pleased you have felt the loved...and it's kept you entertained and distracted whilst you are in there! Feel better soon xxxxx PS Glad you are so well loved ! 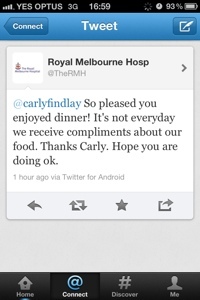 You deserve all the social media love, Carly! Hope you're discharged by Friday! Carly you draw people in through your writing and realness and they are grateful for the experience. I'm glad you feel the love and warmth from your many friends.